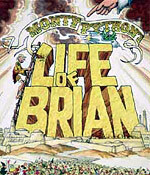 In the wake of Mel Gibson's The Passion of the Christ, Monty Python's The Life of Brian is enjoying a resurrection. This cheeky, irreverent parallel to the life of Jesus is one of the highlights of the last great comedy troupe to make movies. Just make sure you wait until after you've seen The Passion, or you might have trouble not whistling "Always Look on the Bright Side of Life" while Jim Caviezel hangs from the cross. (And don't let the little voice in your head change "Release Barabbas" to "Wewease Bawabbas.") Source: Marty Mapes, Movie Habit.